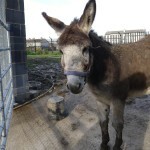 During the construction period which lasted for a year, we arranged for our two donkeys, Andy & Georgina to go on a holiday to the country and stay with our good friends Liam and Catherine. Toby and Patch (the yard dogs) and the rest of the hens and rabbits were found good homes. 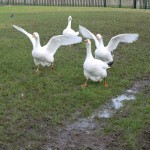 The four geese refused to leave and maintained the unbroken link with the Farm. 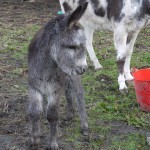 The donkeys and their new foal Millie are now back with us. The geese have been joined by three turkeys and four hens. When all the construction works are finally completed we will reintroduce all the other types of farm animals and restart our school tours. If anyone is interested in getting involved in the farm (especially at weekends) we would love to hear from you. 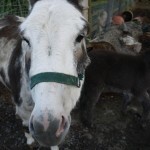 We intend to start a little farm group for children interested in animals. We are working on the history of the Farm and hope to have it ready in a few weeks. We have located some interesting old reports, one been the trip to see Urban Farms in London back in the 80’s.